As entertaining as it is incisive, Stoned is a raucous journey through the history of human desire for what is rare, and therefore precious. What makes a stone a jewel? What makes a jewel priceless? And why do we covet beautiful things? 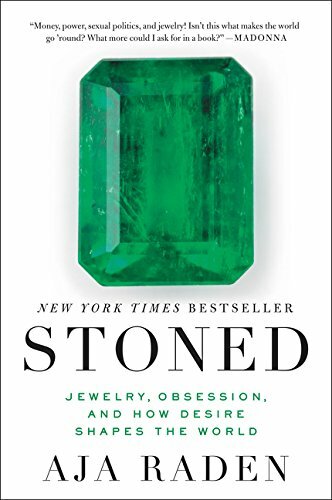 In this brilliant account of how eight jewels shaped the course of history, jeweler and scientist Aja Raden tells an original and often startling story about our unshakeable addiction to beauty and the darker side of human desire. What moves the world is what moves each of us: desire. Jewelry—which has long served as a stand-in for wealth and power, glamor and success—has birthed cultural movements, launched political dynasties, and started wars. Masterfully weaving together pop science and history, Stoned breaks history into three categories—Want, Take, and Have—and explains what the diamond on your finger has to do with the GI Bill, why green-tinted jewelry has been exalted by so many cultures, why the glass beads that bought Manhattan for the Dutch were initially considered a fair trade, and how the French Revolution started over a coveted necklace. Studded with lively personalities and fascinating details, Stoned tells the remarkable story of our abiding desire for the rare and extraordinary. If you have any questions about this product by Ecco Press, contact us by completing and submitting the form below. If you are looking for a specif part number, please include it with your message.